Panorama, Gerhard Richter’s exhibition at Tate Modern, includes so many show-stoppingly great works – Aunt Marianne and Uncle Rudi (the juxtaposition of which I wrote about for MostlyFilm.com), the paintings of Richter’s daughter Betty, squeegee paintings both large and small to name but a few – that it’s a surprise when something quieter, seemingly simpler, works its way under my skin. 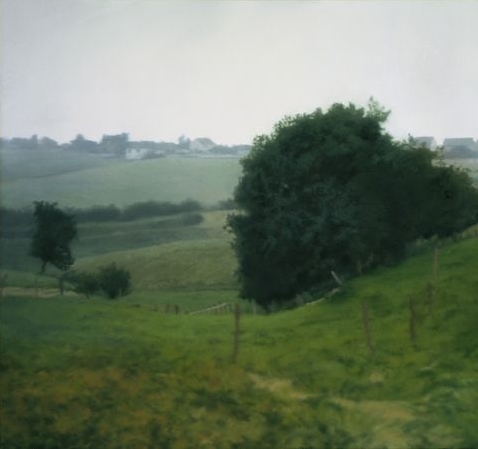 But two rural landscapes, both painted in the mid-1980s, did just that. I was reminded of the time I spent with Barn and Meadowland last weekend at the Whitechapel Gallery when Wilhelm Sasnal’s rather larger argricultural lanscape Pigsty grabbed my attention and wouldn’t let go. It look a while to work out quite why these paintings intrigued me so much. Ultimately it’s a combination of quietness – peacefulness, even – and a vague sense of menace. I couldn’t tear myself away from them because I felt I was waiting; waiting for what I wasn’t certain, but I became part of the landscape, an observer of the scene. To me, these apparently unpopulated spaces felt loaded, weighed down by a significance I couldn’t fathom. In Barn, is the perfect calm of what looks like an idyllic Sunday afternoon about to be shattered? Is the path through Meadowland safe to follow? Honestly, I felt I really couldn’t be sure. Wilhelm Sasnal’s Pigsty, one of the most recent works in his Whitechapel Gallery exhibition, feels very different. In part this is down to scale; whereas the Richter landscapes are relatively modest in size, this painting – over two adjoining canvases – is significantly larger, demanding attention and seen alone on the end wall of the gallery. The low white buildings look more obviously menacing; the swirlingly imprecise foreground suggests that this is not a landscape to savour; in some ways it’s reminiscent of the rushing view from a moving train. Taken at face value, the title tells a story of the industrialisation of agriculture – there is no woodland roaming for these pigs – but the buildings somehow feel yet more sinister. 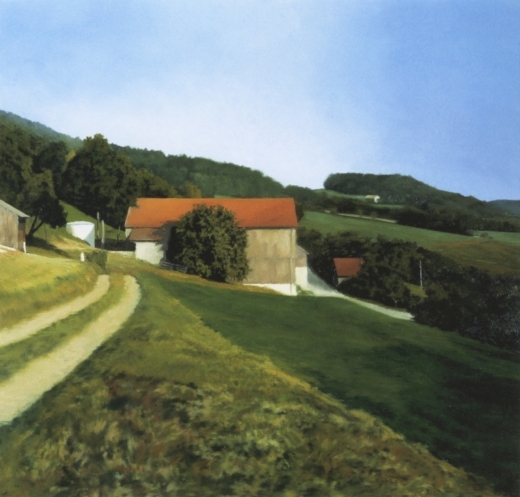 Sasnal’s father, near whose home the pig farm is situated, asked whether the paintings were of Auschwitz. The twentieth century history of Sasnal’s native Poland dominates much of his work and though it may have unintentionally permeated Pigsty, it is nonetheless all too present. Gerhard Richter: Panorama runs at Tate Modern until Sunday 8 January 2012. Wilhelm Sasnal’s exhibition was at the Whitechapel Gallery until Sunday 1 January 2012. This entry was posted in Painting and tagged art, Barn, Gerhard Richter, landscape, London, Meadowland, painting, Panorama, Pigsty, Tate Modern, Whitechapel Gallery, Wilhelm Sasnal by Ann Jones. Bookmark the permalink.